A guest post by Laur Evans about the upcoming publication of a diet book for 4 – 8 year old girls. I have never read a diet book. I think they are misguided doctrines, reflecting the cult of celebrity that dominates our society. They focus on an aesthetic quick fix and not a healthy lifestyle that can be maintained. However, as one of the 1.6 million people in the UK with a recorded eating disorder, I’ve read every book I know to be published on recovering from Bulimia. I would recommend Getting Better Bit(e) by Bit(e) by Ulrike Schmidt and Janet Treasure; a book that highlights the dangers of dieting and helps the user try to find a healthy relationship with food. 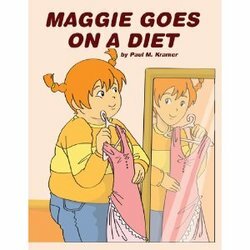 This is why I am so concerned by the pending publication of Maggie Goes on a Diet by Paul Kramer, on the 16th of October, a self-published author of children’s books such as Booger Bob. Maggie Goes on a Diet tells the story of a 14-year-old “who goes on a diet and is transformed from being extremely overweight and insecure to a normal sized girl who becomes the school soccer star” according to the blurb, and Amazon.com gauges the reading level at 4-8 years old. With B-eat, the eating disorder charity, reporting presentations of eating disorders in children as young as 6 years old, do we really need another source telling children that weight loss equates to success? I trust the tween idols of Disney and Hollywood cover this. Having had a turbulent relationship with food, I am a big fan of Jamie Oliver’s work in schools. I am not against communicating the healthy eating message at a young age. I applaud those who provide vital well-researched public health messages on obesity. Yet I find it difficult to believe that this book, with ‘Diet’ clearly in the title (in a cosmetic context), conveys the same ethos. I must state I do not know the author’s intentions, this is most likely a well-meaning ill-judged attempt to curb America’s obesity crisis. However, just as we have Jamie Oliver, the USA have Michelle Obama. She has both the media platform and the well-toned arms to make a dent in the seventeen percent of obese children and adolescents who are obese in the States. I think what sits most uncomfortably with me is the cover. The author’s message seems to be ‘judge a book buy its cover’, so I shall do the same (literally). It contains a typical dysmorphic image of a girl looking into a mirror and seeing a reflection that is not her own. In the mirror she does not see a successful soccer star, but a skinny girl with a small pink dress; a look not a lifestyle she aspires to. It is also a pet peeve of mine the dress is pink, but I don’t think I can hold that against the author or illustrator. Joanne Ikeda, a nutritionist emeritus at University of California-Berkley, was interviewed by ABC News without reading the book. She stressed that highlighting imperfections in a child’s body “does not empower a child to adopt good eating habits” and that “body dissatisfaction is a major risk for eating disorders in children all the way up through adulthood”. I am cautious of any material with this potential. I must stress that Paul Kramer is not a paediatrician, a psychologist or a nutritionist. I cannot help thinking, that given the nature of this book, he should have consulted with one or more of these professions before starting writing. There are many customers on Amazon requesting they withdraw it from sale. I must say I agree, as I am fearful for vulnerable children seeking an unhealthy solution to their poor self-esteem being inspired by this book in the wrong way. *I have emailed a copy of this blog post to Paul Kramer so he can correct any factual inaccuracies and I have welcomed him to give his own opinion. At present I have received no response. I encourage you too to contact Paul Kramer and voice your concerns about this book. Edited to add: Laur has received a response from Paul Kramer, the author of Maggie Goes on a Diet. It is reproduced below in full. I am not a physician nor do I claim to be a dietary expert. I am the author of, “Maggie Goes On A Diet.” This book was NOT written to be a diet book. It is a children’s book written in rhyme intended to entertain. One of my major goals was and is to inspire children of all ages to exercise and eat healthy nutritious foods. By knowing that if they begin an exercise program and modify their eating habits by eating as much healthy and nutritious food as they want, they can build a future foundation for positive eating habits and an improved self image. I DO NOT maintain that the message in this book is a quick fix or that anyone who goes on a diet will be happier, or will be more popular or become a soccer star. In this book, 14 year old Maggie decides to take control over her life without being pushed to do so. Her intent was to become more physically fit, which would enable her to run faster, bend more easily, and improve her skills in playing sports. She was also tired of being teased which was unpleasant at best. You say that you are not against communicating the healthy eating message to children at a young age. I say that I am in favor of communicating the eating healthy message to children and adults of all ages. My response to that is I have been taught that one should NOT judge a book by its cover. I have struggled with obesity for a good deal of my life and I have also recently begun an exercise program and I am eating healthier more nutritious foods. It is also my opinion that “DIET” is not a dirty word. Thank you for the opportunity to respond to your blog. I hope you put in my entire response. Cannot believe this is a children’s book…a huge step too far! Would be interesting to hear the authors point if view on your article. @Ruth, I’m not sure what to feel about it. I don’t think that the cover image is helpful or that the word diet so prominently featured in the title is a good idea but while we have the conflicting messages of skinny models being criticized, while the media and government harp on about the population being in an ‘obesity epidemic’ telling every-one that they’re too fat and too unhealthy it might be a good idea to normalize the idea that hefty kids might have to take care of their own eating habits, be aware of what they’re putting in their mouths and the consequences/benefits of change. If the content of the book reinforces a positive health and lifestyle then it can only be a good thing, if it only concentrates on her appearance and popularity as a result of being thin then it’s bad. The title and cover art are dubious but I think we should read the content before judging this book by its cover. Not sure requesting Amazon remove it from sale is the way to go – I just don’t believe they care enough to do it. We can however tag the book and leave our own reviews. I can tell you, from personal experience, that being over-weight is no fun at all. I’m in my mid twenties, I don’t smoke and I’m teetotal and I get a good bit of walking done with mt two dogs, some I’m reasonbly healthy, except that at 21 stone, I’m big, and like I said – being overweight is not a happy thing to be. I get winded if I climb more than a single slight of stairs, when I sit on a flimsy-looking chair I get worried that it might break beneath me, my body is covered with stretch-marks, most of the stuff in my wardrobe no longer fits me. Whilst I can understand the disagreements that many feminists have with diets and weight loss, in some quarters there seems to be a belief that advocating for fat/weight is the proper response to the diet industry. This seems to me to be the problem – anyone going on a diet is thus moving in the ‘wrong’ direction on the scales, buying in to the (if you’ll forgive me) beauty-industrial-complex? It seems that feminists and their allies on this issue have confused two issues, perhaps deliberately so; a person being bullied because of their weight, and someone wanting to change their weight. One person faces an external pressue, a discrimination that should be fought against. The other however is only battling against the urge to stuff themselves. I know what the standard reponse to this is – that no one is an island unto themselves, and that we are bombarded with advertisements and peer-pressue everyday. To thisI can only say; I disagree, I believe that adverts are associating themselves with what we already, believe, reinforcing something that is already there, not creating something new. I must reiterate I am not against weight loss for health reasons. However, I think this should be done gradually as part of a healthy lifestyle. I don’t believe in crash diets, which work on the basis of heavily restricting food choice. A varied diet is important. Exercise is important. I am not saying wanting to be healthy is conforming to body-faschism. I’ve been overweight and I’ve been underweight – they were opposite ends of the spectrum, but both resulted from an emotional connection with food and low self-esteem. I don’t like that women are segregated on the basis of size. Our fundamental differences are not marked by dress size. I dislike the term “plus sized” (though I recognise it exists as a backlash to the restrictive sizing in the fashion industry). I would like to emphasise that I do not believe eating disorders are caused by the media, but we cannot negate the presence of our society as a variable. One does not have to go as far as developing an eating disorder to note this. Advertising is a manipulative industry, which plays on insecurities already present to push their products. Yes they use societies pre-existing beliefs, but they perpetuate these negative beliefs. Society’s beliefs are not inherent, they are shaped by external factors. (This is why I think the Daily Mail is a danger to society!) For example, fashion magazines will not publish an image that is not edited because nobody would advertise their products in said magazine. Consumer anxiety is driven by the need to own something to improve one’s life – in these magazines it’s often make-up, so they will look like the photoshopped image on the page before. Why would they not want to look like these women? They appear to have success and therefore happiness! I really do hope the author replies, as I am willing this book not to be as it appears! I find this post very upsetting. Although you recognise that a diet book for kids is an awful idea and can promote eating disorders so can the idea of “weight loss for health reasons”. Policing other people’s bodies is wrong and “health” is often used to shame fat people (and thin people). The fact is health and weight don’t directly correlate. But this book’s a bit of red herring, though, isn’t it? It’s self-published, which means no proper publisher would touch it with a barge pole and no market was predicted for it. So no-one will actually bother to buy the book, but journalists get to cover column inches with shock-horror attention-grabbing headlines anyway. Everyone wins! Except the people who are quite understandably distressed by the massive publicity being given to the cover image by the media who are jumping all over this non-story. There are serious feminist issues to be considered and debated surrounding children, diet and self-image, but this isn’t one of them. I must stress I do not support using “health” as a form of shaming. However, weight (obesity) is a risk factor in many diseases and it is one that can be addressed. I do believe it should be done in a supportive fashion, rather than belittling or preaching. I read the author’s response with interest. She defends herself by claiming it is just a fiction story and not an instructive book. But stories are instructive! Fiction, right back to the oral tradition, has always been about understanding the world. People’s views and ideas have always been shaped by stories. She objects to your discussing the front cover with glib ‘you can’t judge a book by it’s cover” but of course, as all designers and publishers know, the cover does communicate something abut the book. Fonts, colours, layout, image are modes of communication, as much as the content and language of the text itself. The comments reflect a lot of debate about weight and image. Overweight people face a lot of prejudice (there are countless reports on discrimination in the workplace, for example) and some of this is probably driven by our image obsessed society, which is very destructive and needs addressing, in so many ways. However, it is a public health issue. Being overweight is undeniably linked to chronic disease. For me, it’s similar to smoking. People can choose to risk their health, but it would be an irresponsible government that didn’t draw attentions to those risks. We need to have an open dialogue about health and eating (both under and over eating) and of course, this needs to be done in a supportive rather than judgmental way. Also, any book offering advice for overweight 4-8 year olds should be aimed at parents, who are almost totally responsible for the way children eat! I don’t believe that telling someone they should lose weight can ever be done in a supportive fashion. What’s more focusing on weight rather than health as a whole is detrimental to health (physical and mental), self image and well being. It’s esactly what you’re complaining about in relation to the book. I disagree that it cannot be done in a supportive fashion. You say “focusing on weight rather than health”, as if the two are mutually exclusive. Weight is not reflective of health, one can be unhealthy whatever their weight. However, as has been said by many, weight can be a risk factor (and I include being underweight in this) of many diseases. Referrals to nutritionists, an exercise scheme, a psychologist etc. can help support someone struggling to lose weight to develop a healthy lifestyle. I’m not saying a referral will solve everything; often these referrals are not successful. But, as a medical student, I would hate to know a future patient of mine could develop diabetes or develop heart complications because I’m too scared to point out they’re overweight and underweight respectively. I believe one should be respectful, compassionate and appropriate with the patient. I also believe a health care professional’s duty is to look out for the wellbeing of their patient and give them a better quality of life, sometimes weight is a factor in this. If their weight does not affect their health, then I agree that weight is moot! I must reiterate it’s not what I’m complaining about in the book. I don’t know how overweight Maggie was to begin with, or if she even fitted into the overweight category. At 14, a child does not need a restrictive diet as they are still growing in hight. I am not advocating weight loss for aesthetics; to fit into a pretty smaller dress. The author is not a healthcare professional and not the best person to recognise someone’s health needs, nor manage said health needs if they should present. I believe a book of this nature, as was suggested above should be targeted at the parents to develop a healthy environment at home. I am terrified, with my past relationship with food, which is not non-existant now, that I will pass on an unhealthy attitude to eating to any children I may have. I’m not saying one should nag, belittle or shame anyone for anything! I don’t care to remark on anyone’s appearance. I apologise for rambling, but I really do hope you recognise that.